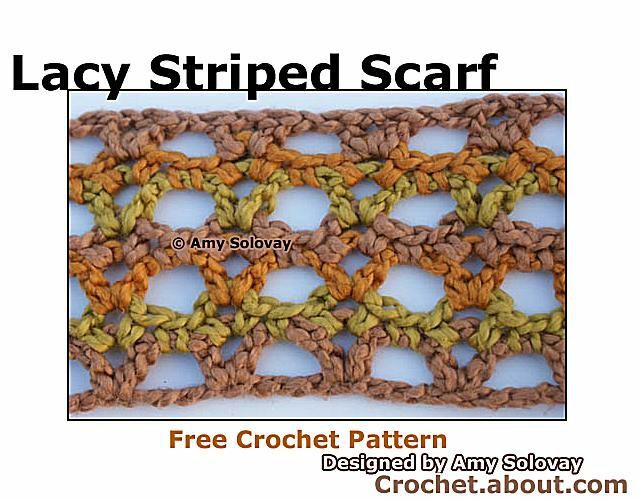 Follow along with these instructions to make your own lacy striped scarf; you'll be impressed with the results! When choosing what yarn you'll be using, check your gauge to ensure that your scarf will turn out to be a wearable size. You have many choices for color combinations using this yarn; choosing a different yarn extends your color options even further. Here, we used "pecan", "olive", and "spice". One ball of each color was more than enough to make this scarf. A size J-10 (6 mm) crochet hook is the recommended starting point for this project. This hook size might or might not be the size that will work best for this project in combination with your unique way of crocheting. Please check your gauge before working the entire project, and make hook size adjustments as necessary. This sample scarf measures 68.5" x 4". Feel free to adjust the measurements of your own scarf if you like. The starting chain will be a multiple of 4 + 9 stitches, and you can add as many rows as you like. Gauge is not crucial for achieving success with this project. Scarves come in a wide variety of sizes, and you can make any size scarf you'd like. If you want your scarf to be exactly the same size as mine, you can feel free to match my gauge, which is given below. It is not strictly necessary to do so. If you are off by a little bit, your scarf should still turn out fine. If your scarf will turn out to be significantly wider or longer than mine, you might need to buy additional yarn so that you do not run out. My Gauge: When working in pattern, 3 stitch repeats = 5"; 7 rows = 4". Anticipate color changes at the end of every row. When you reach the last stitch in each row, work all the steps except the last step in the old color. To complete the stitch, draw through a loop of the new color. Work your turning chain and the next row in the new color. If you'd like to avoid weaving in extra loose ends, you can carry your unused colors up the sides of your work. The linked tutorial shows the basic idea while working in single crochet, but you can use the same sort of technique with the stitch used here. This process will leave some long strands along the sides which will need to be dealt with during the finishing process. That part is easy; you'll work a row of single crochet stitches overtop of the carried strands to hide them. Using color A, ch 169. Row 1: Working in color A, dc in 4th ch from hook, (ch 1, skip next 3 chs, V-st in 4th ch from hook.) Repeat sequence in parentheses all the way across the row. When you get to the end of the row, work a dc in each of the last 2 chs. Change colors to color B. Row 2: Working in color B, ch 1, turn. Sc in each of the first 2 dc sts. (Sc in ch-1 space, sc in next V-st, ch 3, sc in same V-st.) Repeat sequence in parentheses all the way across the row. When you get to the end of the row, Sc in the last ch-1 space, then work 1 sc in each of the last 2 sts. Change colors to color C.
Skip the first sc; the turning chain counts as the first dc. Dc in next sc. (Ch 1, V-st in next ch-3 space.) Repeat sequence in parentheses all the way across the row. When you get to the end of the row, ch 1, then work 1 dc in each of the last 2 sts. Change colors to color A. Row 4: Ch 1, turn. Sc in each of the first 2 dc sts. (Sc in ch-1 space, sc in next V-st, ch 3, sc in same V-st.) Repeat sequence in parentheses all the way across the row. When you get to the end of the row, Sc in the last ch-1 space, then work 1 sc in each of the last 2 sts. Change colors to color B. Row 5: Ch 3, turn. Skip the first sc; the turning chain counts as the first dc. Dc in next sc. (Ch 1, V-st in next ch-3 space.) Repeat sequence in parentheses all the way across the row. When you get to the end of the row, ch 1, then work 1 dc in each of the last 2 sts. Change colors to color C.
Row 6: Ch 1, turn. Sc in each of the first 2 dc sts. (Sc in ch-1 space, sc in next V-st, ch 3, sc in same V-st.) Repeat sequence in parentheses all the way across the row. When you get to the end of the row, Sc in the last ch-1 space, then work 1 sc in each of the last 2 sts. Change colors to color A. Row 7: Ch 3, turn. Skip the first sc; the turning chain counts as the first dc. Dc in next sc. (Ch 1, V-st in next ch-3 space.) Repeat sequence in parentheses all the way across the row. When you get to the end of the row, ch 1, then work 1 dc in each of the last 2 sts. Do not cut yarn yet. Using color A, ch 1 and crochet a row of evenly-spaced single crochet stitches across the end of the scarf. If you carried your yarns up the sides of your work, be sure to crochet overtop of the carried yarns to hide them. Otherwise, the carried yarns might snag on things when you wear the scarf. When you are finished with this row, cut the yarn and weave in all your loose ends. Attach color A to the other end of your scarf and work another row of evenly spaced sc across the remaining end. Weave in your remaining loose ends. Block your scarf if desired.